Meet Our April Dog of the Month! Hi my name is Whiskey and I am a 7 month old Golden Retriever! I live in Skagit Valley, Washington and I love the outdoors. Adventures with my parents are my favorite. Fetch, frisbee, swimming, and chasing birds are my go to activities...You could say that I live up to the "retriever" name! I am quite affectionate and I love belly rubs and snuggles. I am so excited to join the Grrr8 Dog Treats Family, I will do anything to get my paws on those treats! P.S. My parents are teaching me how to lay and wait with treats on my paws. Submit your dog's photo to Grrr8 DogTreats at bark@grrr8dogtreats.com. Include a dog bio (100 words or less), your name, city and state. 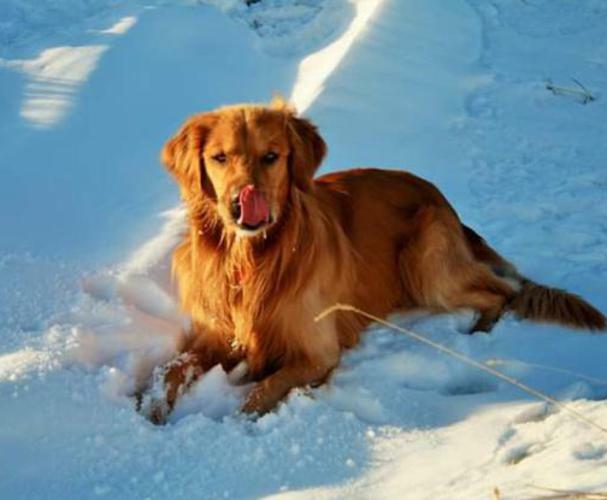 If your photo is chosen, we’ll send you free tail waggin' Grrr8 DogTreats – Now that's better than a tummy rub!